With the stock market in full-blown panic mode, shares of these renewable energy stocks are looking more and more attractive. To paraphrase Baron Rothschild in a slightly less violent way: When there is panic in the streets, buy property. For many investors today, seeing stocks decline can be an anxiety-inducing event. As bad as it feels, though, it's important for many to remember that they will likely be net buyers of stocks for years to come. That means sell-offs like this should be viewed as an opportunity to buy stocks in great companies at prices 10%, 20%, even 30% less than what they were just a couple months ago. With renewable energy growing at staggering rates, we asked three Motley Fool contributors to highlight a stock they think investors should have on their radar with the markets in sell-off mode. Here's why they picked Pattern Energy Group (NASDAQ:PEGI), TerraForm Power (NASDAQ:TERP), and TPI Composites (NASDAQ:TPIC). Jason Hall (Pattern Energy Group): Over the past year, this renewable energy producer has faced some challenges. Rising interest rates, along with changes in U.S. tax law that reduced the pool of potential tax equity investors, have both increased the cost of capital and made it harder to find potential investors or to deliver high-return investments. At the same time, the devastation of Puerto Rico's electric grid caused Pattern Energy to go months without operating one of its largest wind farms. That, plus the sale of its operations in Chile, has put a pinch on its cash flows. The dual impact of these things caused management to put the brakes on dividend growth and has many investors who follow the company convinced the payout will end up getting cut. Considering that Pattern Energy has actually paid out more cash available for distribution than it generates in recent quarters, this is a legitimate fear. But even with the risk of a payout cut, I think the potential rewards of owning Pattern are worth that chance. Management has already taken a number of steps to shore up the balance sheet and improve cash flows. The sale of its Chilean operations is one good example. The company netted over $70 million from the sale and has already deployed $38 million of that into a project in Canada that is expected to generate a double-digit cash flow yield. These steps have it on track to reach breakeven on its dividend coverage at the midpoint of its full-year guidance. 2018 has been a challenging year for renewable energy producers to navigate, and it looks like Pattern's management will have successfully brought the company through relatively unscathed and positioned to return to growth in 2019. With a dividend yield of 9% at recent prices and a solid likelihood management will be able to avoid a cut, Pattern is an ideal candidate to put on your watchlist right now. Tyler Crowe (TerraForm Power): When asset management group Brookfield Asset Management acquired TerraForm Power, the renewable energy company was in rough shape. Its previous owner had sold several of its assets at less-than-attractive prices, loaded it up with debt, and did little to focus on the day-to-day operations of the business. With TerraForm now under the Brookfield umbrella, it is already showing why the change of ownership was exactly what TerraForm needed to be a good investment. This past quarter was a great example of Brookfield showing how this collection of solar, wind, and energy storage assets can be better utilized. In TerraForm's most recent earnings release, management highlighted a slew of operational projects that will likely lead to either significant cost savings or higher revenue. After commencing a comprehensive review of its solar assets this past summer, the company already found its assets were able to produce an extra 56 gigawatt-hours with relatively minimal capital investment. Also, thanks to new operating and maintenance contracts for its North American wind portfolio, it expects to significantly reduce its operating costs. It's little house-cleaning items like this that show why Brookfield is such a great manager of these types of assets and how the company expects to grow cash available for distribution by 16%-21% through improving its existing assets. There aren't a lot of companies in the renewable energy industry that have shown themselves to be good stewards of shareholder capital, but Brookfield has, and it bodes well for the future of TerraForm Power. Rich Smith (TPI Composites): Windmill-blade maker TPI Composites had a miserable third quarter. With six of its manufacturing lines in "transition" to making new types of windmill blades, and five more lines in start-up mode, more than 20% of the company's production capacity was operating at less than full capacity, resulting in a near-20% decline in blades produced, a 6% drop in billings, and a 56% plunge in profits. Analysts think TPI will earn a bare $0.35 per share in profit this year -- 72% less than last year, according to data from S&P Global Market Intelligence. But here's the thing: December 2018 marks the end of TPI's "transition" year of 2018. In 2019, production, sales, and profits should all surge as new production lines spin up and TPI begins addressing the $6.3 billion in contracted backlog it's been hired to produce over the next four years. Profits that fell 72% in 2018 are expected to surge 270% in 2019 -- then grow another 350% through 2022, by which point TPI should be earning nearly $6 a share. Long story short: 2018 has been a tough year to own TPI, and many shareholders probably went through it with their eyes squeezed shut to avoid seeing the carnage. 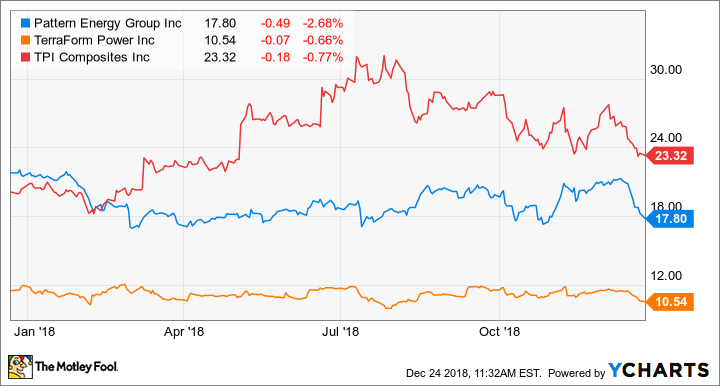 With the transition now mostly complete, and TPI stock selling for less than four times what it's expected to earn in 2022, December is the time to open your eyes -- and watch TPI stock outperform in 2019 and beyond.